Is there Gold in Missouri? Panning and Prospecting for Gold. Gold only occurs in very limited quantities in Missouri. Nearly all of the gold that is found here is extremely fine flour gold. There are no reports of any significant amounts of gold being recovered by commercial mining ventures. 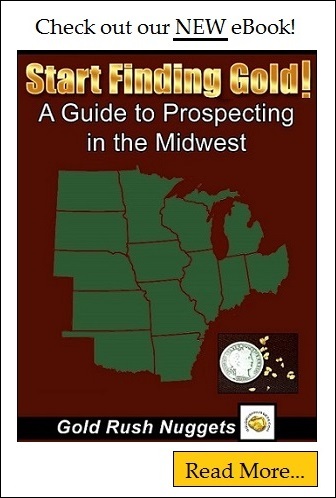 Missouri’s gold will mainly be found in the northern counties, near the Missouri River. Glacial gold is what you can expect here, which usually extremely fine gold that was brought down from Canada during the last ice age. Richer gravels from up north were brought down and deposited in scattered locations across Missouri and numerous other states in the eastern United States. This gold rarely accumulates in quantities worthy of large-scale mining efforts, but there is enough fine placer gold available for recreational prospectors who want to find some gold. Patience will be necessary, and it may take many trips to find an area in this state that has much in the way of “color”. Since gold in Missouri was deposited by glaciation in roughly the northern 1/3 of the state, most success will be found in these areas. Charriton River has placer gold that can be panned. Other rivers worthy of investigation include the North Fabius, Mussel Fork, Grand, Thompson, and Platte River. It is likely that all of these rivers as well as tributaries could have small amounts of gold present, as well as the Missouri River. Gold is likely to be extremely fine, so careful panning will be required.